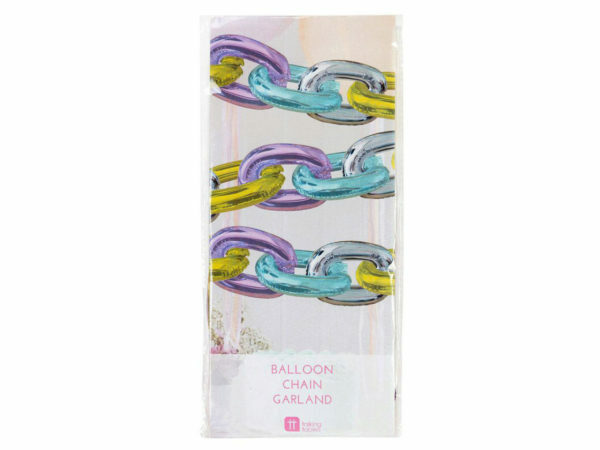 Decorate your party with these fun foil chain link balloons. All you have to do is to inflate them with the straw provided, link them together and hang around for a high impact decoration — the banner feature nine silver, eight gold, seven pink, and seven teal foil chain balloons. Each balloon is approximately 7.5" when inflated. The garland is approximately 10' feet in length. It comes packaged in a hanging polybag and panel.